FILE: Imports from the U.S. are seen at a supermarket in Shanghai, China April 3, 2018. U.S. President Donald Trump says American farmers will be big beneficiaries of more trade with China. "Under our potential deal with China, they will purchase from our Great American Farmers practically as much as our Farmers can produce," Trump said Monday on Twitter. In another comment, he said China "has agreed to buy massive amounts of ADDITIONAL Farm/Agricultural Products - would be one of the best things to happen to our farmers in many years!" The U.S. leader said one result of talks with China last week in Washington is barriers to U.S.-Chinese trade and tariffs on each country's exports will "come down for (the) first time." President Trump's tweets come a day after U.S. Treasury Secretary Steven Mnuchin announced the two nations have agreed to back away from imposing tough new tariffs on each other's exports, after reaching a deal Saturday for Beijing to buy more American goods to "substantially reduce" the huge trade deficit with the United States. 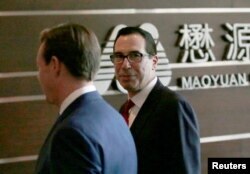 FILE - U.S. Treasury Secretary Steven Mnuchin, right, and a U.S. delegation arrive at a hotel in Beijing for trade talks with China, May 3, 2018. Mnuchin told Fox News the world's two biggest economic powers "made very meaningful progress and we agreed on a framework" to resolve trade issues. "So right now we have agreed to put the tariffs on hold while we try to execute the framework," he said. China's state-run news agency Xinhua quoted Vice Premier Liu He, who led Chinese negotiators in trade talks in Washington this past week, as saying, "The two sides reached a consensus, will not fight a trade war, and will stop increasing tariffs on each other." 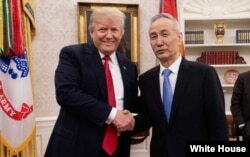 President Donald Trump meets with Chinese Vice Premier Liu He at the White House, May 17, 2018. China's state-run news agency Xinhua quoted Vice Premier Liu He, who led Chinese negotiators in trade talks in Washington, as saying, "The two sides reached a consensus, will not fight a trade war, and will stop increasing tariffs on each other." Explainer: What is a Trade War? Liu said the agreement was a "necessity;" but, he added, "At the same time, it must be realized that unfreezing the ice cannot be done in a day; solving the structural problems of the economic and trade relations between the two countries will take time." Trump had threatened to impose new tariffs on $150 billion worth of Chinese imports and Beijing had responded that it would do the same on American goods. Mnuchin and White House economic adviser Larry Kudlow said U.S. Commerce Secretary Wilbur Ross would soon go to Beijing to negotiate on how China might buy more American goods to reduce the huge U.S. trade deficit with Beijing, which last year totaled $375 billion. The United States has signaled it wants to trim the deficit by $200 billion annually, but no figure was mentioned in the agreement reached over the weekend. Philip Levy, senior fellow on the global economy at the Chicago Council on Global Affairs, tells VOA that while the U.S. and China have for now avoided a tariff war, the outcome of the trade talks remains unclear. "I think the Trump administration will crow about the fact that they arranged for some additional sales. That really wasn't the issue. It may have been in their minds, but in terms of what is in the national interest, it wasn't," he said. Levy says the result is a managed trade solution that still does not answer the fundamental question of how a state-dominated economy the size of giant China fits into the global system. But Kudlow said there has been a lot of progress. "You can see where we're going next. As tariffs come down, the barriers come down, there will be more American exports," he told ABC television, saying any agreement reached will be "good for American exports and good for Chinese growth." One contentious point of conflict between the U.S. and China is the fate of ZTE, the giant technology Chinese company that has bought American-made components to build its consumer electronic devices. The U.S. fined ZTE $1.2 billion last year for violating American bans on trade with Iran and North Korea. ZTE, however, said recently it was shutting down its manufacturing operations because it could no longer buy the American parts after the U.S. imposed a seven-year ban on the sale of the components. Trump, at the behest of Chinese President Xi Jinping, a week ago "instructed" Commerce Secretary Ross to intervene to save the company and prevent the loss of Chinese jobs. Even so, Kudlow said, "Do not expect ZTE to get off scot free. Ain't going to happen." Ira Mellman and Kenneth Schwartz contributed to this article. US China Sending Signals, But is Trade Deal Close?